A few months back, it was reported that contractors responsible for including news items inside the News Feed’s Trending Topics section were suppressing news of interest to political conservatives on purpose. Well, Facebook obviously denied the allegations, but even so, it has spent the past few months trying to do damage control and make sure that the conservative user base does not go away angry. So Facebook has decided to make a some changes to Trending Topics. You may have noticed them already. 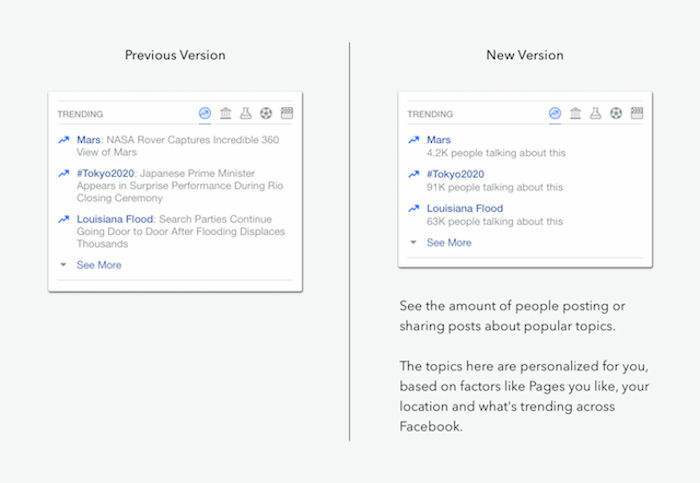 The Trending Topics section in the News Feed will now be more automated and humans will no longer be required to write descriptions for news items. Humans will be helping to keep legitimate Trending Topics separate from mundane hashtags like #MondayBlues for instance. Editors will also be combining multiple hashtags and keywords associated with a single trend under a unified topic. Doing it this way should please everyone, or so they hope. We will see how it goes. An algorithm will be put in place that’s going to go through the news stories about an event and automatically select snippets to display to users who click on a trend or hover over it using a mouse.